Before the Twilight mania, I've already seen the "apple" book on several bookstores but I also had an ebook during that time so I decided to read it first to see if its as good as advertised. So I found myself going back and forth to National Bookstores & Powerbooks branches but the paperback version of Stephanie Meyer's Twilight is sold out! I found it ironic that I had to sign up for book reservation while weeks ago, the apple book was lying on those bookshelves flashing the apple to get my attention. 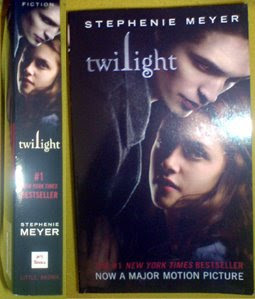 When I accompanied my sister at Trinoma last Wednesday, I thought of dropping by at National to see if a Twilight paperback is finally available. To my delight, there's a pile of it in the corner shelf, but its the movie version, no more apple. Another good thing is its discounted, it costs me 215 pesos. A hard to find item, check!